What an interesting life and career you have had. Are you still in touch with any of the artists that you lived with in Drop City? Yeah, there’s a lot of stuff coming out about Drop City. There’s a Drop City documentary being made. Gene Bernofsky, Richard Cohen…I’m in fairly good touch with them. How would you describe your lifestyle/experience in Drop City? To me that was one of the most exciting times of my life. It seems like the media wants to show Drop City as a hippy commune, but we always called it an artist’s community. It was a very synergetic and creative place. A lot happened there. The ideas generated at Drop City are still very important to me. The media likes to mis-interpret the Drop City. They think Drop City means “drop out” or “drop acid” but Drop City was before those words were around. It came out of Drop Art [a movement informed by the “happenings” of Allan Kaprow and performances by John Cage, Robert Rauschenberg, and Buckminster Fuller at Black Mountain College]. Do you think being around other creative people helps the artistic process? Yeah, that goes all the way back to Drop City. Before starting Drop City I had attended several Buckminster Fuller lectures, and he talked about this idea of synergy, which means that the whole is greater than the sum of the parts when you have all of these hard-working individuals. But when you have interaction between the people you get a result better than an individual could produce. You are currently the head of the painting department at Rocky Mountain School of Art and Design. What do you enjoy about teaching? I like to teach. I never think that "teaching" is the correct word. But I am there and the students are there and they work on their art and I’m looking at them working on their art, trying to nudge them. And I like that a lot. It definitely affects my own thinking and my own work, and there is a little bit of dread of retirement because there would no longer be that synergetic relationship between the students and myself. Although here at Redline [Gallery] there is a lot of the same synergy as in an art department. Would you consider art to be another form of scientific exploration? I think “art” is a very big word. There have been paintings done by artists that have been studied where the artist is operating in a scientific mode. But I also think that artists use a lot of mathematics in art. Fractals [fragmented geometric shapes that can be split into parts, each of which is a reduced-size copy of the whole] were pioneered by artists. The geometry of the quasi-crystal was invented by a couple of artists, and one of them was me. As an artist I am free to work with scientific ideas without being bound by the scientific rigor. There is a certain spiritual/philosophical presence in your paintings that is achieved by exploring the invisible structures and infinite possibilities of space. Are the emotive qualities in your work tied to these explorations, or is there also a more personal level of emotion involved? Well, I do think that the emotional side of paintings is very important. A lot of people don’t think of my work as very emotional or spiritual. I feel like my work in tessellations and patterning often compares to the work done in Islamic Mosques. These artists in 1200 AD Persia were really just as much mathematicians; there was no line between making their artwork and mathematics. When I walk into an Islamic Mosque—and I’m not Muslim—I feel that it is so beautiful that it’s a spiritual experience. 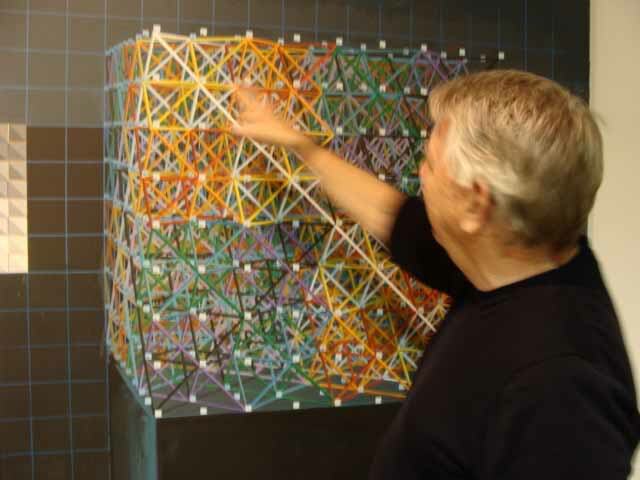 Would you say that the process of making art is both spiritual and mathematical for you, then? How would you say Rothko influences your process? I always considered Rothko to be such an incredible genius when it comes to proportioning and color. I don’t see myself as a colorist. I sometimes call my process ‘color-coding’. I want it to look as good as possible, but I am not a color genius like Rothko. My major interest is in Buckminster Fuller. Fuller said that space is stretched in tension, and I compare that to a canvas which is stretched in tension. I think that Rothko used this tension of the canvas. I say I am influenced by Rothko, but a lot of people look at my paintings and they don’t see it. I see it because I am thinking of this surface stretched in tension, and I try to feel the same way that I think Rothko painted, and I don’t know many other artists that are into that. How would you describe the personal aspect of your artwork? A lot of people look at my paintings and they say that I should paint with a computer. But I don’t want to paint with a computer. My feeling is that there is something about the hand-made brushstrokes that is really important, and a computer does not make these kinds of brush strokes. So the process of using your own hands is personal to you? Yes, it is all very important to me, I really get into the symmetry between my hand, the brush, and the canvas...although I don’t think many people see that in my paintings... I’m into facture. Facture in France means the ‘artist’s touch’ and the way a paint surface is constructed. My meaning of facture fuses those two definitions. Is your exploration of space also an exploration of time? Do you believe that all reality is interconnected through seen and unseen structures? Yeah, that sounds about right. I think that most reality is unseen, that we see a very small part of the spectrum. It seems like sciences and spirituality sometimes go hand in hand. Well I like the title of the book the Tao of Physics. That book talks about fusing physics/spirituality. The use of chance coin tosses to determine the direction of the serpentine lines in your mural at MCD [Metropolitan State College of Denver] creates a very dynamic quality of motion and life. Do you still use any elements of chance in your work? Yes, but kind of secretively. I still do droppings and I am interested in randomness. I recently put pennies out in the environment to see how long they would stay put, about 20 dollars worth of pennies, I would just lay them out on the pavement, sometimes in arrangements, and it was amazing how long they would stay there and people wouldn’t pick them up. Also, this was a funny one. I went to a bus stop and I put a little envelope and pasted it in the bus stop, and wrote on it ”Please do not take Charlene’s bus money.” I put some dollars in and then watched all day long and all these people that you’d think would take it didn’t, until the end of the day some kid took the money. But it lasted a lot longer than I though it would.